Calais at Dawn. Driving Home from France. “What do I need to drive in France?” if you’re asking yourself this and it’s your first time then great, you’ll love the experience and you’re in the right place because I am compiling a comprehensive series of articles about driving in France for you. Lets start with the basics, French driving regulations – they are obviously there to ensure you have a safe trip but as well as the obvious ones such as what you need to carry, there are also things that you must do. I always put together a folder of documents to take before I go which has all of my accommodation and transport details as well as the all important required driving documents if needed by the authorities. Not only does this mean you have everything handy for the police but also for the port officials who may well stop and search the car. As a single parent it’s also very important for me to have proof of my daughters birth because if you are travelling alone with a child you will be stopped on both sides. Make sure you have birth certificates and also a letter of consent from the other parent if you are able to obtain it. When I travelled from Plymouth to Roscoff last year I was stopped 5 times by both port officials and police. So, what do I need to drive in France? To make things easy you can go to Amazon and get your France driving kit here – just click the picture and you’ll be taken to Amazon which is of course secure. I’ll put a link at the end of the article too if you want to continue reading. If you have to stop for emergency reasons there are a couple of things to remember. If you leave the car you must wear your High Vis Jacket before you get out. Drive on the right! If you’re from the UK make sure you’re ready for it. Most of the road signs are self explanatory but if you want a guide there is one here. Traffic lights are much the same as elsewhere in the world in terms of the sequence of colours but you will notice that there are smaller sets sitting below the main lights, this is common in towns and you may see a supplementary arrow allowing you to turn right for instance. On roundabouts you give way to the left and common sense prevails, the flow and volume of traffic you see while out on the non motorway routes is good and easy to navigate through. One piece of advice I have us to avoid Paris and more specifically la Peripherique, you could be there for hours, even days! Driving in Paris will be challenging so unless you are foolhardy and have a few hours to spare I suggest using public transport in the City. If you are coming in by plane and doing a fly drive holiday to France you will also need to check your licence validity – click here to go to a list of countries and requirements. Overall car hire in France is affordable and the fuel is cheaper than the UK, this may not be the case if you are flying in from another country but again, check out the current fuel prices here. 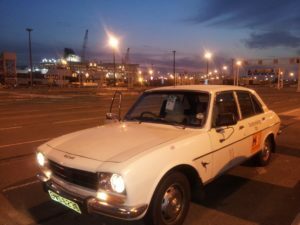 I will add to this page with more useful resources but for now, thanks for reading, I hope this has helped to answer your question of What Do I Need To Drive In France.